Breast calcifications are a medical condition wherein small calcium deposits are present within the breast tissue. These deposits of calcium are a non-palpable finding visualized by mammography. 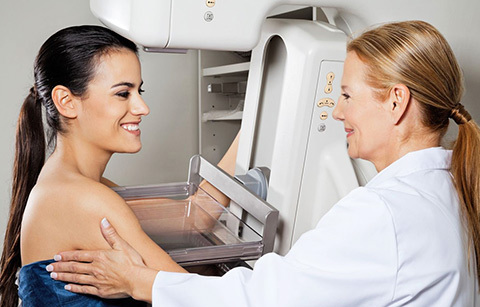 In a mammogram, the calcium deposits appear in the form of small, white spots, often called flecks. Breast calcifications are usually hard-to-detect without medical examination since usually, they cannot be felt as lumps. 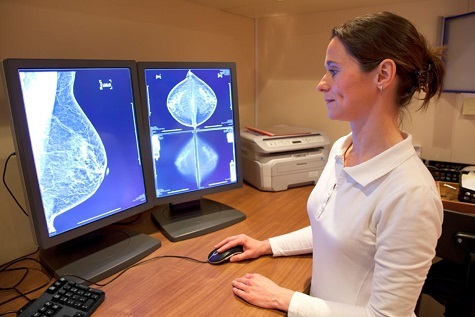 Because certain calcification patterns have been linked to carcinoma, mammography has played a major role in early detection of breast cancer. This does not mean that calcifications found on a mammogram is a diagnosis for cancer. About 80% of breast calcifications have nothing to do with cancer, but are most likely the result of normal wear and tear. 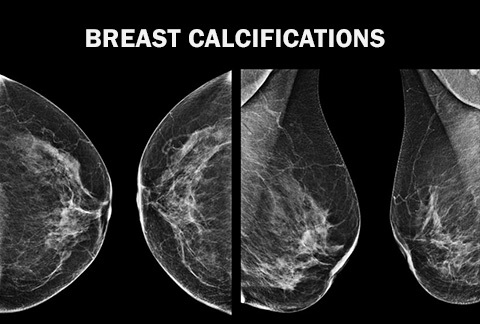 During a mammogram-based examination, breast calcifications are further divided into two types — microcalcifications and macrocalcifications. 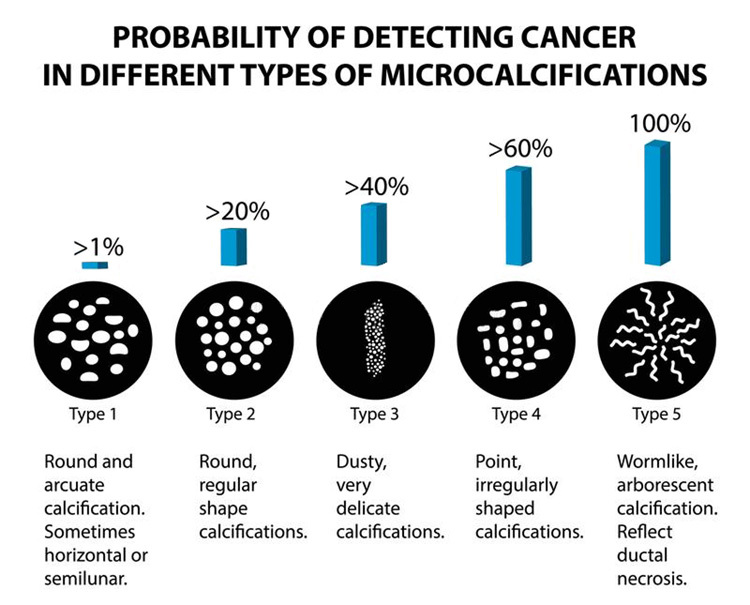 Microcalcifications are very fine particles of calcium that are deposited in a region of the breast, and there are many kinds, both benign and malignant. Malignant types result from the abnormal growth of cells. The benign types of calcification are extremely common, and actually occur in approximately one of every three women. They are usually larger and contain fat, or they appear in solid, straight lines, as opposed to small, particulate areas. Macrocalcifications are the large, course calcifications that are found in the breast, and are very commonly seen on mammography. They can be related to breast trauma or prior surgery or abnormalities and they are completely unrelated to any kind of malignant process. Breast macrocalcifications are bigger in size and are often attributed to some changes in the breast tissue owing to old injuries, clogged breast arteries or history of substantial inflammation in the breast tissue. The difference is primarily size-based and macrocalcifications appear in the form of visible specks on the mammogram, the size similar to that of salt grains. Microcalcifications are present as smaller dots that need to be viewed with greater introspection. It should be understood that though largely regarded as non-cancerous, breast microcalcifications may be interpreted as the precursor or a pre-cancerous condition. Since the core cause of microcalcification and cancerous growth is the same, i.e. abnormal/exaggerated cellular activity, there is always a risk of the condition taking a cancerous route in the future. Thus, further testing and seeking a professional medical opinion is strongly advised. Benign calcifications tend to be rounded and relatively uniform in size and density. Malignant calicifations are linked to irregular clusters that vary in morphology. These malignant breast calcifications are most frequently found in the mammary ducts and are arranged in a linear or branched manner. Women who are post-menopausal are more susceptible to having breast calcifications. Most breast calcifications are regarded as non-cancerous or benign but their presence can make a woman very apprehensive since the calcifications can assume bigger proportions, often taking the form of hard-to-remove clusters. If your physician is concerned or unsure about an area of calcification in breast tissue, it is normal for a biopsy to be ordered. Usually, biopsy is not sought for macrocalcifications as the chances of them turning cancerous are nil whereas when dealing with microcalcification, mammographical examination is often followed by biopsy to ensure that there are no chances of a cancerous growth. Microcalcifications often don’t appear on the mammogram. However, the patient may still complaint of some heavy or ‘bump-like’ feeling though a lump too is not visible. When this happens, needle biopsy (ultrasound-guided or x-ray guided) as the course of progressive testing is recommended. This form of testing extends beyond just visual examination of the breast tissue and seeks an invasive sample. 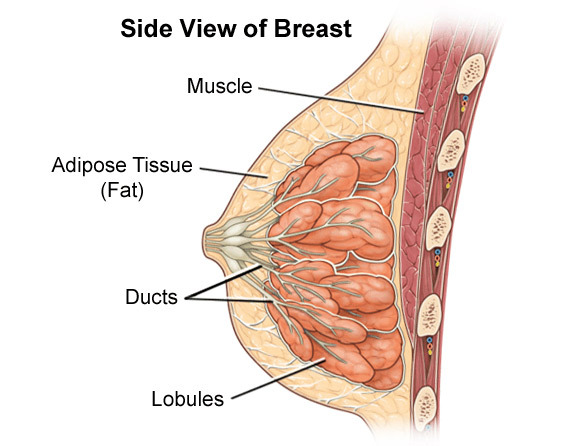 The internally accrued breast tissue sample is then thoroughly examined under special microscopes by a certified pathologist. 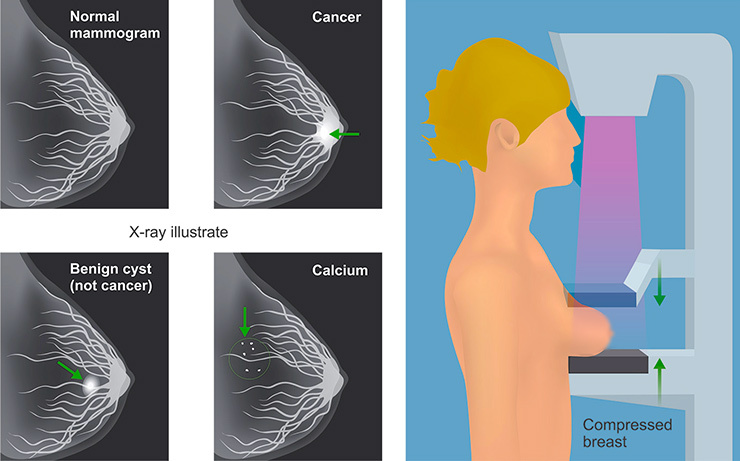 Some radiologists may undertake a slightly more aggressive approach when trying to detect the presence of breast calcifications and undertake more tests to ensure that malignancy has not begun in the tissue surrounding the microcalcification sites. The testing procedure is a bit demanding since it needs to be done regularly, according to schedule. Usually, a three-or-four-month interval is sought between each testing appointment and during the interval, certain literature is provided to check upon any changes in the development of cluster/lump feeling that is worthy of being brought to the physician’s attention.